Inspired by History. Ancient Roman Ring. Made to order in the United States. Sterling Silver. Whole and half sizes, 7-14 available. A re-creation of a 1st c. (A.D.) Roman ring. Although the original shows the wear of time, we have turned back the clock on our re-creations and re-made this ring as it was when new. (Or asit could have been -while the original was cast in a common man’s Bronze we will make this ring in Bronze, Sterling Silver or, as a very special order, 14k Gold.) The originals that our Roman Ring collection is based on were originally worn and lost in the Roman provinces of Dalmatia, Germania, Iberia and Britannia (modern day Croatia, southern Germany, Spain and England) in the early first century (A.D.). As is the case with most of our Historic Ring replicas none of our Roman Rings are based on ceremonial rings worn by high caste Romans, Patricians, Senators and Knights. 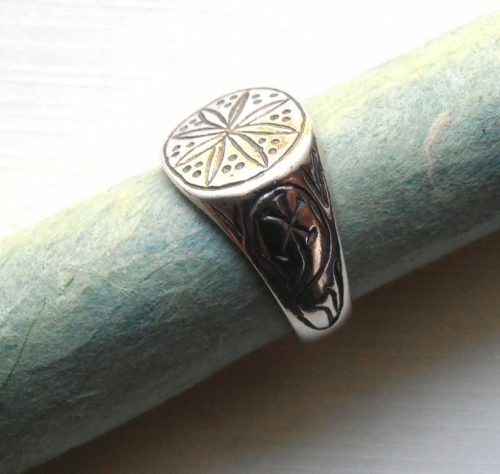 Instead the majority of our rings are based on bronze originals which may have been worn by any common Roman foot soldier or freedman either in Rome proper or the provinces. During the early Roman Imperial era bronze rings lacked the hierarchical status of gold rings which were frequently reserved for those of the patrician class. (The wealth of Rome in the early first century also made it possible for all but the poorest Romans to afford an array of adornments.) 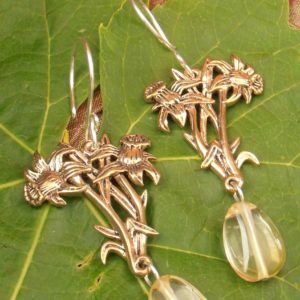 Bronze was the metal of choice for the vast majority of jewelry made and worn during the Roman era. Because of its affordability vast quantities of bronze jewelry were made, worn and eventually lost. Today we can only guess at the original meaning behind many of these early designs. The designs found on some of these rings may have had a personal meaning to the original wearer. 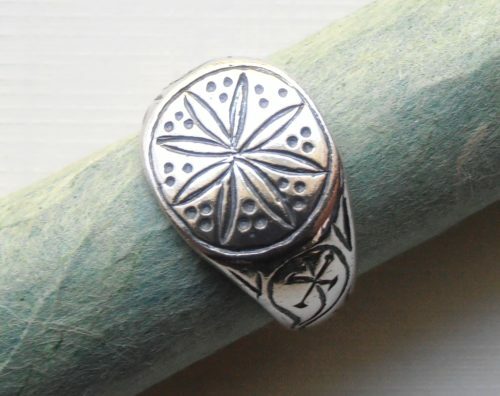 Some rings were inscribed with the symbol or number of a legion. Some had a name, a good luck charm or a religious symbol. Some designs may have been chosen for their pleasing appearance alone. In most cases we will never know. 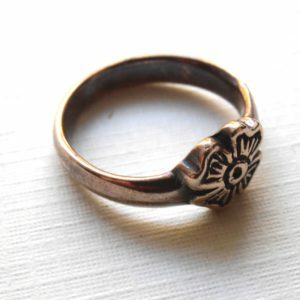 The mystery will endure much as the bronze original of this ring endured for two thousand years. As these rings are usually custom orders -made to your size, not the ‘stock’ size- there is generally a three to five week wait. A surcharge will be added for sizes over 11. *Prices subject to change due to fluctuating precious metals markets. 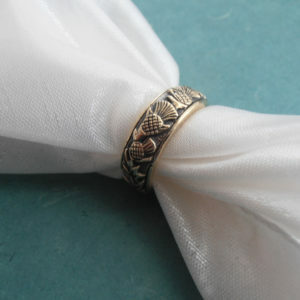 As a special order this ring is also available in bronze, the original metal.